These Apostles of the Seventy are mentioned in Acts 6:5. Saint Prochoros became Bishop of Nicomedia and reposed in peace. Saint Nicanor was stoned to death in Jerusalem. Saint Timon became Bishop of Bostra in Arabia and ended his life in martyrdom by fire at the hands of the pagans. 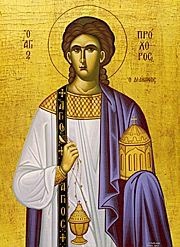 Saint Parmenas died in peace in Jerusalem. By faith ye were shown forth as the Word's hallowed deacons, His ven'rable eye-witnesses, and chosen vessels, Nicanor and Prochoros, glorious Timon and Parmenas; hence we celebrate today your sacred memorial, and with joy of heart, we keep the feast now in gladness, whereon we all call you blessed. Share the feast of Prochoros, Nicanor, Timon, & Parmenas the Apostles of the 70 with an icon greeting ecard.